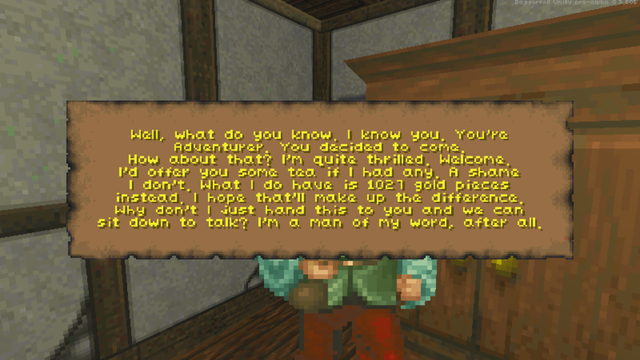 Thieves Guild Extra Quest: "As the Crow Flies"
This chain of quests eventually becomes endless, as the final quest in the chain repeats itself with a few variations. If you want, you can earn gold forever with this fellow. 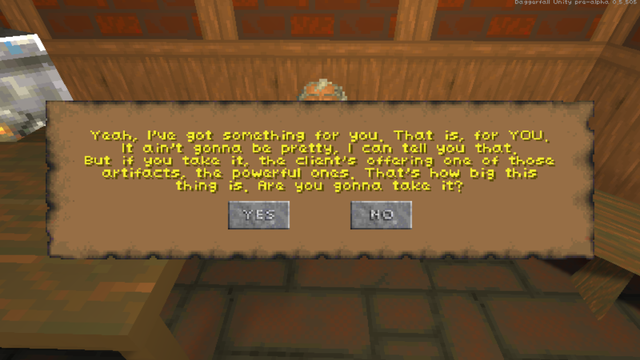 This was quite simple to put together, as a lot of the quests recycle the same actions. 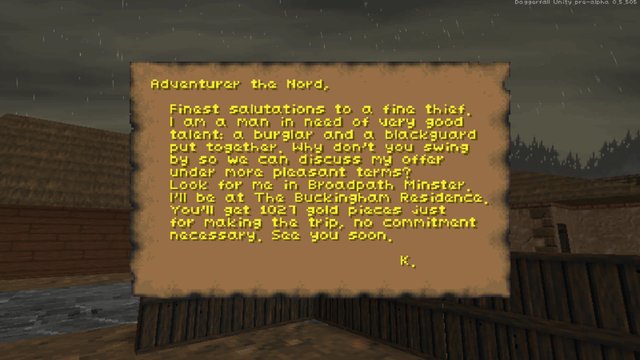 It was still fun to make a multi-part questline, though. I'll be trying more ambitious things in the future. 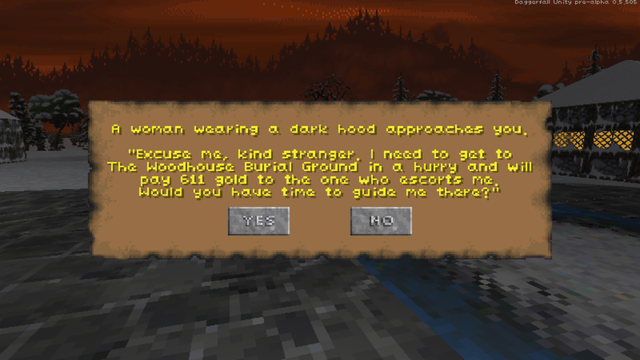 Yep, that's a Perpetual Quest. Those can show up at any time and any place. 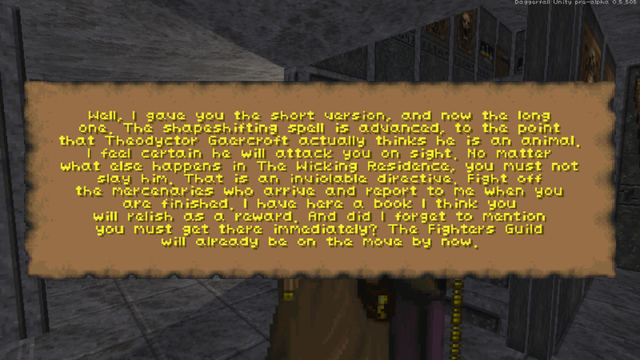 While peasants don't tend to spend their time in dungeons, who's to say one won't make a rare appearance down there? Perpetual Quest #18: "Under Cloak and Dagger"
This may look fairly straightforward, but every decision should carry a risk, I say. I have writer's block on a multi-segment Mages Guild quest right now, so I'm just putting together little things like this in the meantime. I think Kamer's Warm Ashes is a good example of small-scale events that liven up DFU, and I plan to make more things like this rather than full-scale quests for the Perpetual line. Yeah, I'm really satisfied with that one. It all just sort of fell together into one big meaningful quest. I worried too much travel might be too tedious but I think I got a right balance there. 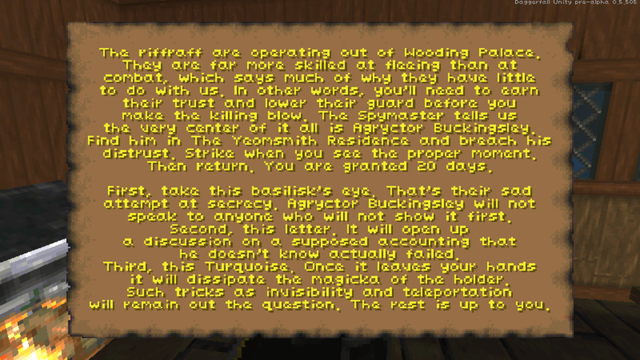 Mages Guild #14: "Darkness Falls"
There are two victory outcomes here. This was a little complex to write but it looks like it's working fine. I think it's a good addition. 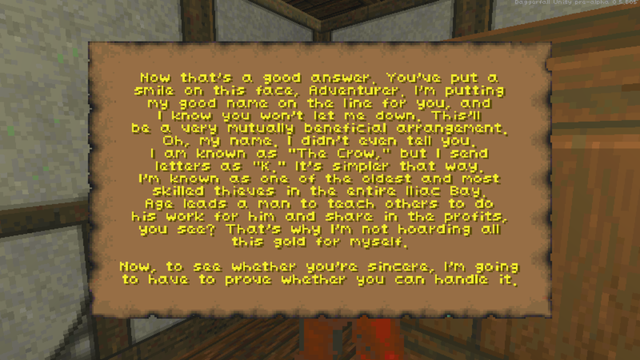 Thieves Guild #9: "Only the Best"
This is what I've settled on for the Thieves Guild artifact quest. I've mentioned before that artifact quests are going to be blatantly unfair, and that's true here. 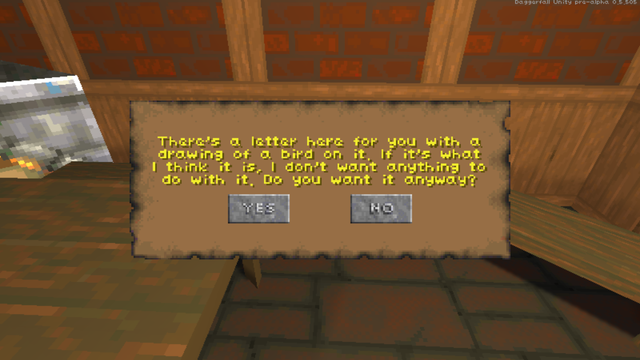 The quest has no time limit, but the player can throw the bag away in exchange for a reputation hit. The difficulty's going to be pretty uneven for different characters. I do know it's going to be very hard in general, but some characters are going to have it easier than others. I'm not completely sold on this idea but it's thiefy, it's hard, and it takes thinking and skill to get through it. I just wish I had some deeper story to it. Mages Guild #15: "To Free the Shackled"
The victim can appear as a spider, a scorpion, a bear, or a harpy This is yet another quest where finishing it will tank your rep with the opposing guild, so choose wisely. 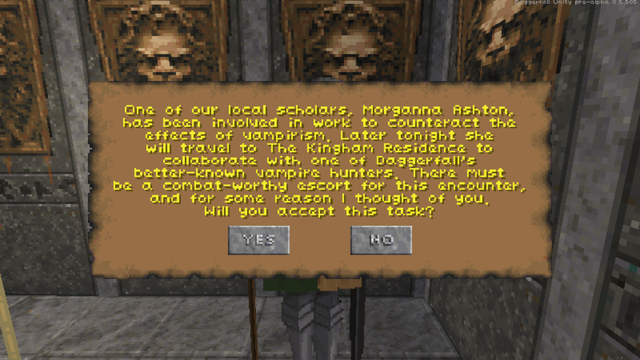 I'm not really sure whether this is actually a Mages Guild quest. 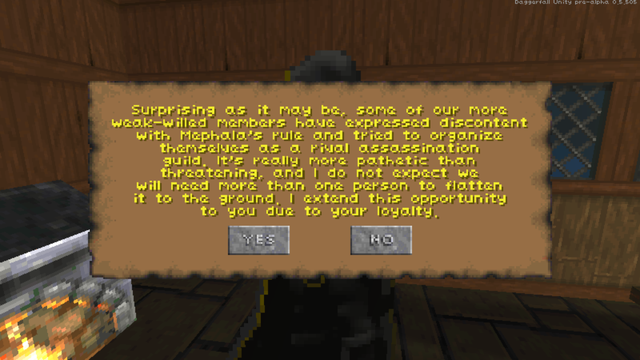 It doesn't seem to fit a knightly order since they don't make enemies with civilized people, nor for the Dark Brotherhood or Thieves Guild either. 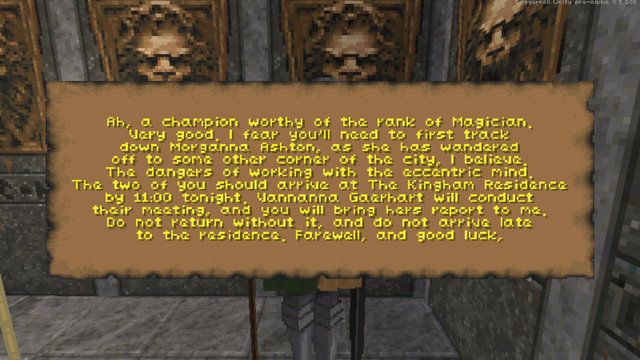 This could maybe be a commoner quest or a temple one, but Mages just seemed like the closest fit. Still not sure. Dark Brotherhood #12: "Pulling Weeds"
This idea was inspired by Interkarma a little while ago in this topic. I didn't go nearly as far with the idea as he suggested, but perhaps that will be for another day. 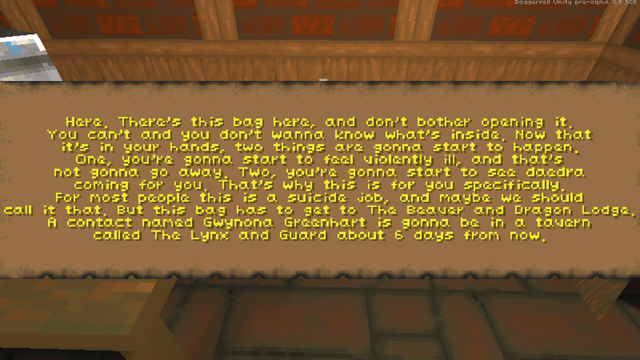 Pay particular attention to the quest giver's instructions! These rival upstarts are very suspicious, after all. 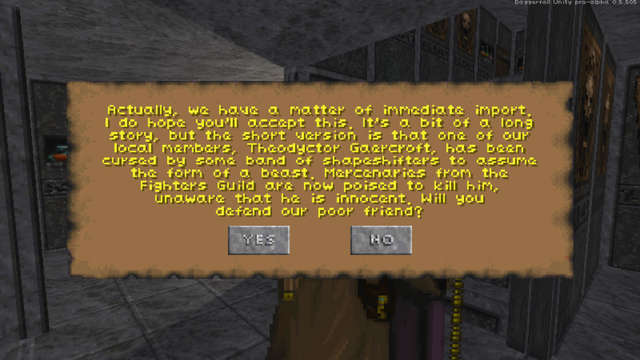 This is the 77th custom quest for DFU's classic guilds.